Habit: Annual. Stem: branched from base, erect, < 7 dm, glandular-hairy. Leaf: blade lanceolate to oblong-ovate, acute. Inflorescence: spike-like raceme; bracts wide, +- red, +- persistent, +- = fruit. Flower: 1--2 mm, 2--3 mm in fruit; perianth pale pink to white. Fruit: 2--2.5 mm, nearly as wide, wrinkled between generally 4 wide ribs. 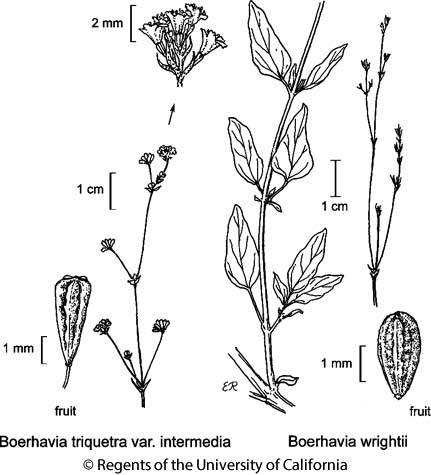 Citation for this treatment: Andy Murdock 2012, Boerhavia wrightii, in Jepson Flora Project (eds.) Jepson eFlora, http://ucjeps.berkeley.edu/eflora/eflora_display.php?tid=15835, accessed on April 22, 2019.